Fluorouracil and imiquimod creams are fully subsidised topical treatments, suitable for some patients with non-melanoma skin cancers; Special Authority approval is no longer required for subsidy. Their place in treatment depends on the type, severity and location of the lesion(s), as well as the expertise and experience of the prescribing clinician (in terms of other treatments which can be offered) and the patient’s preference. Surgical excision is the recommended first-line treatment for non-melanoma skin cancers in the majority of cases.1 Fluorouracil 5% and imiquimod 5% creams may be a treatment option for superficial lesions, where surgical excision or other treatments such as cryotherapy are not practical or desirable by the patient. Additional treatment options for non-melanoma skin cancers, e.g. ingenol gel (not subsidised – refer to the New Zealand Formulary ) and photodynamic therapy (using photosensitising drugs activated by specific kinds of light to target cancerous cells), may also be offered to patients. Fluorouracil and imiquimod can be effective treatments for non-melanoma skin cancers, when used appropriately. When prescribing these medicines, ensure that patients understand how, where and when they should be applied, and what precautions to take when handling, storing and disposing of the medicine. It is important that patients avoid excessive sun exposure, especially with fluorouracil treatment. 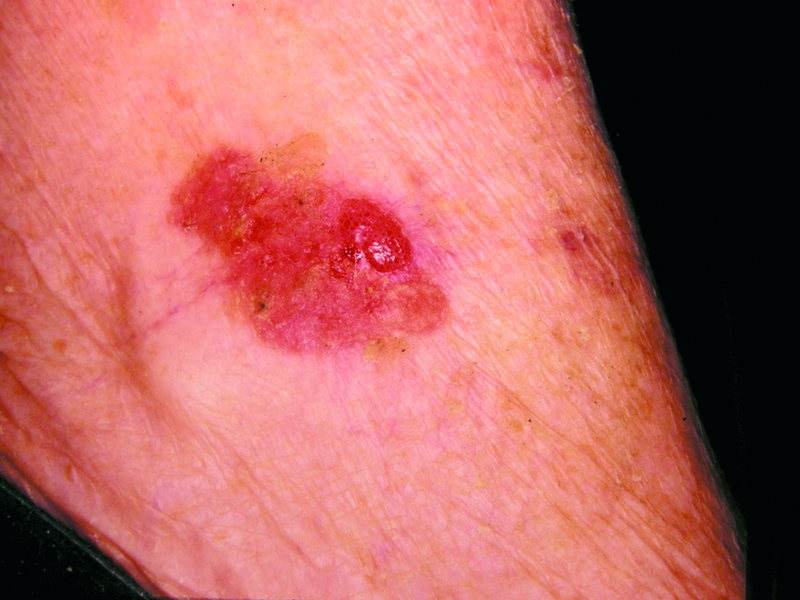 These lesions, which are usually flat, scaly and non-pigmented, develop on skin damaged from ultraviolet (UV) light exposure. Actinic keratoses are benign but can progress to invasive malignant disease if left untreated.2 Surgical excision is not routinely performed, due to the nature of the lesions. 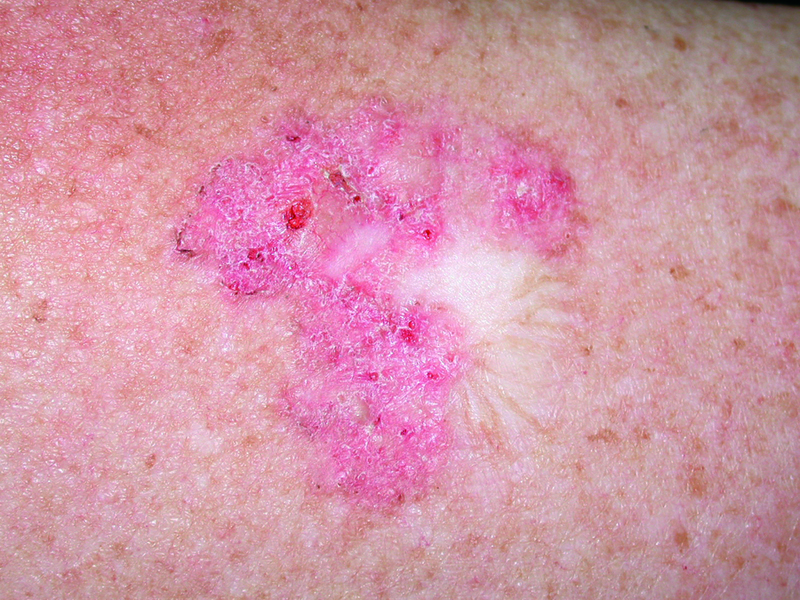 However, some actinic keratoses may be hypertrophic, in which case shave excision can be performed.2 Biopsy is not usually necessary for an isolated lesion of typical appearance, but should be considered for patients with recurrent lesions or if the diagnosis is unclear.2 If the extent of actinic keratoses makes treatment impractical, long-term surveillance is essential for early diagnosis of malignancy. Cryotherapy is effective in treating small (< 2 cm) superficial BCC on the trunk and limbs, with cure rates of approximately 90% if performed by an experienced practitioner.4 This is an option if surgical excision is not possible due to the location of the lesion or the patient’s preference. Cryotherapy can leave an unsightly white mark on the treated skin. Imiquimod is also an effective treatment for superficial BCC on the trunk, upper limbs, anterior chest or neck, with long-term clearance achieved in over 80% of treated patients.4 It is less effective when used on lower limbs and generally impractical for the posterior trunk due to inaccessibility. Fluorouracil is generally not used to treat superficial BCC as it is less effective than imiquimod, but may be considered for very small superficial lesions. Recurrence of lesions is common with fluorouracil treatment. SCC has a varied presentation and may arise from actinic keratoses. SCC is more likely to metastasise than BCC and is associated with a higher mortality rate.4 Surgical excision is first-line treatment. SCC confined to the epidermis is referred to as SCC in situ (also known as intraepidermal carcinoma or Bowens disease) and is considered a low-risk lesion (Figure 3). If surgery is not an option, cryotherapy can be an effective treatment for small lesions with well defined borders.4 Treatment may not be practical if the patient has multiple lesions, but surveillance is essential to identify invasive SCC early. Fluorouracil can be used to treat SCC in situ. There is a lack of evidence for imiquimod to treat SCC in situ, but in practice it is used (off-label) with satisfactory results. Recurrence of SCC in situ is common, regardless of which treatment is used. Application is likely to cause erythema, then scaling, tenderness, erosion, ulceration and necrosis. Re-epithelialisation of the skin then occurs. Application is likely to cause erythema, erosion, excoriation/flaking, oedema and itching of affected skin. Painful erosions can occur on mucus membranes. Tretinoin cream may be used for two weeks prior to fluorouracil treatment to enhance the effect by peeling off the top layer of skin. This can also reduce the amount of time that fluorouracil needs to be used. N.B. Some patients with sensitive skin may not tolerate tretinoin. It is not recommended to apply a topical corticosteroid to treat a reaction (unless severe) as this may affect the efficacy of imiquimod. If intolerable local adverse effects occur, the cream should be washed off. Assess clinical outcome 6 – 12 weeks after treatment has eased; treatment can be repeated for a further six to ten weeks if response has been inadequate, provided that there has been at least a four week break since the first treatment. Depending on the patients symptoms, petroleum jelly, an emollient or a mild topical corticosteroid can be used to assist healing. Thank you to Dr Amanda Oakley, Honorary Associate Professor and Dermatologist, Waikato District Health Board for expert review of this article.